Gonzalo Higuain is playing some of his best football this season for S.S.C. Napoli and is hugely responsible for their recent rise. Napoli are on top of the Serie A standings after twenty matches played and are in the round of 32 of the Europa League having destroyed their group opposition. Higuain has scored 20 goals so far in the Italian league and is the first player to reach that milestone in Europe this season. Pierre-Emerick Aubameyang of Borussia Dortmund and Jonas from Benfica are close behind in the race. Out of those twenty goals, the Napoli striker scored only one from the penalty spot. 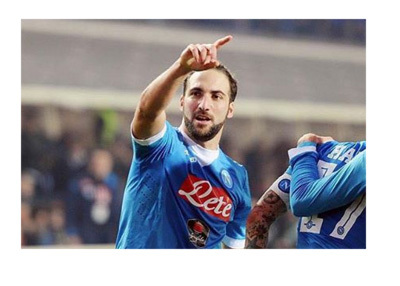 'Pipita' Higuain is terrorising defences this season and is the key man in Napoli's title pursuit. At 28 years of age the ex River Plate and Real Madrid player is in his prime. With bigger clubs openly expressing interest, one would imagine that it might be tough for Napoli to hold on to him past this summer. Will the Argentina international be able to bring the title back to Naples? It would be the club's third ever, and first since Diego Maradona days. Either way, great to see Gonzalo Higuain playing well. Great Serie A season so far!